Tresooth Cottages is a select development of beautiful barn conversions and purpose built properties which are arranged neatly around a pretty courtyard and offers guests free and unlimited access to an excellent range of leisure facilities including a communal heated swimming pool, jacuzzi and sauna. Karensa Cottage is situated in the main courtyard and is on two levels. It has an open plan living/ dining room with exposed wooden beams. The kitchen has a slate tiled floor. The stairs from the lounge lead up to a first floor landing and back door. There is a double bedroom with en-suite shower room & WC on the ground floor which has a door that takes you into the courtyard. 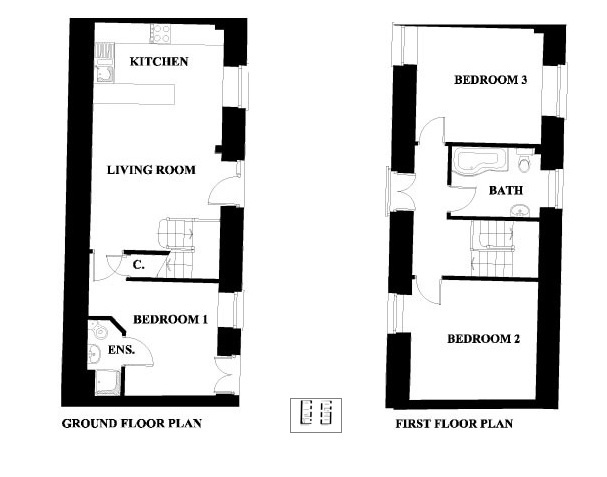 There is a further double and twin bedroom upstairs sharing a main bathroom with an over bath shower. This high end barn conversion is finished to an excellent standard and includes all of what you would expect from a modern home. The cottages are set around an enclosed courtyard that features its very own working water well. The barns are found tucked away in a peaceful centrally positioned location in a spacious area of natural beauty. Each cottage has a fully equipped farmhouse style kitchen with built in appliances including a microwave, dishwasher, washing machine, fridge and freezer. The living areas have flat screen TV, free-view and DVD players. Tresooth’s outstanding outdoor facilities include a large heated outdoor swimming pool with sun loungers (open 1st April - 30th September), jacuzzi, sauna, seating area, indoor games room (please note that some games are chargeable), a children’s play area with trampoline, swings, slide and an enclosed pond with fish. Electricity, heating, bed linen & towels are all included but you will need to provide your own beach towels. There is parking available for a number of cars on the property. Up to 2 well behaved dogs are permitted at no additional cost although please remember that you cannot leave dogs unattended in the cottage alone. Regrettably no smoking is allowed. There is an iron and ironing board. A cot, high chair and stair gate are available upon request. Karensa Cottage is situated just one mile from the quaint Cornish village Mawnan Smith, and three miles from the bustling port of Falmouth. Here you will find a host of shops, bars and restaurants, the award winning National Maritime Museum and Trebah Gardens which is not to be missed. Thank you for your nice review. We are glad you had a nice stay and were able to enjoy the facilities regardless of others. Guest from Blandford Forum stayed for 14 nights. We stayed at this cottage last year and had a few concerns. My wife phoned the agent the week before we went and mentioned our problems from last year. On arrival all our requests.had been acted on. We were very pleased with the customer service and would stay again as this is an excellent location with a lovely pool and jacuzzis to relax in at the end of the day. Thank you. Graduation week and family holiday. A great location near Falmouth. Plenty of room for five adults and two dogs. Comftable beds. Two good bathrooms. Kitchen utensils were poor quality. Knifes were blunt and metal pan handles got very hot. No dishes to cook food in the oven. This was a shame as we were self catering. Thank you for taking the time to review one of our properties. We are glad you had an overall enjoyable experience and with regards to your comments on the kitchen equipment I've forwarded this to the onsite Manger to sort our replacements, sorry about that. We love the location of the cottage and facilities were excellent. The children absolutely loved the pool and the games room. The cottage itself was very clean and well equipped. The only slight criticisms would be that the downstairs mattress dipped in the middle and as someone who has back problems I found this uncomfortable (I would have changed room but didn't want my 11 yr old sleeping downstairs alone). also I didn't feel comfortable leaving the children to play in the play area as there were 2 dogs that were free roaming on occasion. Not sure if they were the owners and I should mention that they seemed friendly enough. Only had one problem which we did not bother to report. Upstairs shower kept turning cold but we just used the downstairs one! Rest of cottage great. Spacious & well equipped. Stayed at Karensa Cottage for 1 week in September 2015. Know the area so knew what to expect in terms of surroundings. Cottage was very clean and well provided with all that one could need. Couldn't really ask for anything else except slightly better weather! Would probably book again. Just a couple of points that may interest the owner. Outside entry exit door woodwork could do with a spruce up to be more "welcoming". Curtain or some such over upstairs door to the outside would have been nice for one's modesty coming out of the bathroom. Guest from Wallingford stayed for 7 nights. Karensa cottage is in a nice little complex with adequate parking. All the units were dog friendly and this aided a chat with the neighbours without being in each others pocket. The location was fine and the cottage completely adequate. We felt home from home. The pool and hot tub were great.WE enjoyed our stay. Overall a convenient and comfortable cottage although lacking in natural light,making it rather dark. Kitchen area well provided for, although the dining table surface needs attention.The downstairs bedroom has no hanging space at all which is a bit inconvenient. The upstairs batrhroom cistern handle needed repairing when we arrived - we repaired it temporarily, but it needs attention. The main settee is becoming very worn in places. The initial directions to the cottage were rather vague without the aid of a satnav. Guest from Starnberg stayed for 14 nights. We stayed at the Karensa Cottage with a family of 5 persons. The cottage offers lots of space and a nice place to be outside for eating. The pool (fresh water) and the Jacuzzi was the favourite place of our children. Although there are several houses sharing a common courtyard it was silent and intimate. We felt very comfortable being in this place. Issues to improve in the installation: - The barn and rubbish bins in the parking space give a very bad reception and the bin very always full - The kitchen equipment is scarce for up to 6 people and used up (pan, no soup plates). - The games in the common game room imperfect or broken (even a risk for playing children), although some of them are not free of charge - Internet / Wi-Fi is available but speed is annoying up to unacceptable - Toilet flush sometimes not working or not stopping pouring water - Wardrobe missing in one sleeping room. Although the Cottage is situated in a nice countryside, lots of interesting places are not far away. As well shopping facilities and places to eat and drink are on short driving distance. Karensa Cottage is recommendable even more if the game room were in better conditions, the barn covered with a simple door and the kitchen equipped a good piece better. A wonderful cottage providing all home comforts and sufficient space for 4 adults and two children. The facilities including pool, spa and play area was ideal for the children. We also benefitted from the courtyard that gave our children a chance to play and make friends with the neighboring children. The grounds are especially attractive and well maintained. Darren was also very prompt and helpful when we called upon him for assistance. We had a lovely time exploring Falmouth and the Lizard. I would have no hesitation in recommending this property.